The taste of your espresso will, of course, depend on personal preference and on many other factors such as the type and freshness of the coffee bean used, the coarseness or fineness of the grind, and the tamping pressure. We recommend you experiment by varying these factors to achieve the espresso taste you prefer. The GRIND SIZE dial accurately adjusts the fineness or coarseness of the espresso grind for optimal espresso extraction. The grind size should be fine but not too fine or powdery. The grind will affect the rate at which the water flows through the ground espresso in the filter, which affects the taste of the espresso. If the grind looks like powder and feels like flour when rubbed between fingers, it is too fine and the water will not flow through the ground espresso even when under pressure. The resulting espresso will be over-extracted, too dark and bitter, with a mottled and uneven créma on top. If the grind is too coarse, the water will flow through the ground espresso too quickly. This will result in an under-extracted espresso, lacking in flavor, and without the thick créma on top. If you’ve just ground your coffee, your Filter is already filled. If you’re using pre-ground coffee, ensure that the Filter and Portafilter are completely dry before using the Coffee Spoon provided to fill the Filter. Double Shot Filter (makes 2 oz. espresso) – 2 flat scoops NOTE: Do not tamp between scoops. 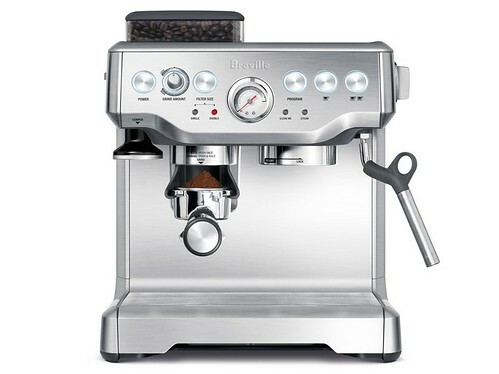 The dual wall technology of Breville espresso machines helps even beginners achieve an especially rich créma. Best results are achieved using freshly ground coffee and the right grind setting. Another key to the best espresso is knowing how to tamp the coffee. A single shot of espresso is made from about 7 grams of ground coffee (or a pod) in the Filter. Brewing time (from the moment you start the pump) is approximately 20 seconds and produces a shot glass-worth of 1 ounce (30ml) of espresso. A double shot of espresso is made from 14 grams of ground coffee, takes 20 to 25 seconds to brew, and should yield about 2-2.5 ounces (60-74ml) of espresso. In most cases when the espresso tastes weak, it is due to over-brewing or using a coarse grind. In proper brewing, a single shot (1 ounce) of espresso is made from about 7 grams of ground coffee in the Filter. One level scoop using your Coffee Spoon is 7 grams. Brewing time (from the moment you start the pump) is approximately 20 seconds. A double shot (2-2.5 ounces) of espresso is made from 14 grams (two level scoops) of ground coffee and takes 20 to 25 seconds to brew. Once that volume has been reached, the grounds will be fully extracted, and any further brewing can affect the quality of the espresso. Weak or watery espresso results from using a coffee grind that is too coarse. When purchasing pre-ground coffee, use a grind suitable for espresso machines. ‘Espresso Blend’ only refers to the flavor and roast of the bean; ‘Espresso Grind’ refers to the fine grind needed for espresso. If there is not enough coffee in the Filter, you’ll get a weak espresso: You should use 7 grams for a single shot and 14 grams for a double shot. Please use the Coffee Spoon that came with the machine. Weak espresso results when the coffee is not tamped firmly enough. Use the Tamper to press the ground espresso a little more firmly before brewing. Brewing time (from the moment you start the pump) should be approximately 20 seconds for a single shot and 20-25 seconds for a double shot of espresso. Check whether the coffee grind is too coarse. Also check that there’s enough coffee in the Filter. You should use 7 grams for a single shot or 14 grams for a double shot. Using the Coffee Spoon that came with the machine, one level scoop is 7 grams. Finally, if the coffee is not tamped firmly enough, the water will run through it too quickly. Use the back of your Measuring/Tamping Spoon to press down the espresso a little more prior to brewing. A good créma results from fresh coffee, the right grind, proper tamping, and a clear Filter. If the coffee isn’t fresh, the créma is not the best. Ideally, the coffee is ground immediately before extracting a shot. Pre-ground coffee should not be kept longer than a week, and coffee beans should be used within a month. Both are best stored in an air-tight container kept in a cool, dark place. When the coffee grind is too coarse, the créma suffers. When the coffee is not tamped firmly enough, you lose créma. Try a firmer pressure, using the Tamper. If the Filter holes are blocked, you’ll get a poor créma. It’s important to clean your Filter after each extraction. Used grounds should be thrown away with domestic waste. Discarding used grounds in the sink can cause the drain to become blocked.